Our team of healthcare contributors thinks you should steer clear of these three companies. Sometimes it can be just as important to know which stocks you shouldn't buy as it is to know which ones you should. To help you separate the good from the bad, we asked a team of Fools to highlight a healthcare stock they think should be avoided. Read on to see what they said. Todd Campbell: GlaxoSmithKline PLC's (NYSE:GSK) 5% dividend yield may have you thinking that it's worth stashing in your portfolio, but fast-approaching competition for its best-selling drug, Advair, makes it too risky for my money. Advair, an asthma and COPD medicine, accounts for about 15% of GlaxoSmithKline's revenue, and patents protecting Advair from generics have already expired. Patents protecting Diskus, the inhaler that delivers Advair, have kept generics on the sidelines, but Diskus' patents expire this year, and that means a big hunk of GlaxoSmithKline's sales are about to be called into question. Mylan, much maligned recently for its EpiPen pricing, is among the generic-drug makers that are circling. The FDA expects to issue a decision on whether to approve Mylan's generic Advair next March. Ahead of that decision, GlaxoSmithKline is attempting to protect Advair's market share with other asthma and COPD drugs, but sales of those drugs remain tiny in comparison with the $1.1 billion-plus that Advair Diskus hauled in worldwide last quarter. Overall, Advair Diskus' uncertainty makes me think that GlaxoSmithKline's dividend could be at risk, and for that reason, I'm more interested in owning other Big Pharma stocks. 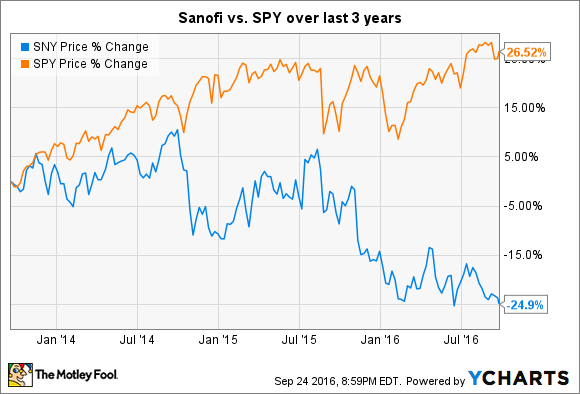 Brian Feroldi: French pharma giant Sanofi (NASDAQ:SNY) hasn't given its investors much reason to cheer over the past few years. This company has relied heavily on uber-successful drugs such as Lantus and Plavix to generate growth, but sales of both are falling because of pricing pressure and competitive launches. In turn, the company's shares have lost nearly a quarter of their value over the past three years, badly underperforming the S&P 500. In response to the weak performance, Sanofi's board brought in a new leader named Olivier Brandicourt and tasked him with getting the company back on track. However, given Sanofi's size and product portfolio, that won't be easy. Brandicourt attempted to appease Wall Street by laying out his five-year vision. His plan centers on the successful launches of six new blockbuster drugs, which he believes will reverse the revenue decline. If everything goes according to plan, then sales will grow by 3% to 4% annualized between now and 2020. While I always appreciate it when a company lays out a long-term plan, I have a hard time getting excited about low-single-digit revenue growth. That's especially true considering Sanofi is banking on all of those new product launches to help it hit its numbers. What happens if one of them turns out to be a dud? Sanofi may not be the worst investment in healthcare, but why bother owning this stock when faster-growing giants can be purchased just as easily? For that reason, I plan on avoiding Sanofi's stock until it turns these promises into a reality. Cory Renauer: Despite a slew of analyst upgrades, Sarepta Therapeutics (NASDAQ:SRPT) stock is best avoided in the near term. The FDA's controversial approval of Exondys 51, formerly eteplirsen, has caused the company's market cap to swell to around $2.9 billion. The drug has an eye-popping list price of about $300,000 and an addressable patient population of perhaps less than 2,000 American boys with Duchenne muscular dystrophy (DMD) amneble to exon 51 skipping. With more exon skipping DMD drugs in development, Sarepta's price would be justified if there were some solid evidence its drug is effective. DMD patients suffer from the inability to produce enough dystrophin, and Exondys 51 is designed to allow production of a shorter yet functional version of this vital muscle component. Untreated, patients' muscles get progressively weaker, and patients usually succumb to their disease by age 30. The FDA based Exondys 51's conditional approval on observed dystrophin increases in some -- not all -- patients treated with the drug, because many samples had to be thrown out because of Sarepta's failure to implement high-quality procedures. In addition, while this conditional approval is based on increased dystrophin production, there's no clear evidence that the drug actually helped patients maintain muscle strength. The open disdain that multiple FDA officials have expressed for Sarepta's approach to drug development is enough reason to avoid this stock. If regulator opinions aren't enough for you, though, consider this: To maintain Exondys 51's approval, Sarepta needs to show patients secretly randomized to receive a higher dosage of the drug benefit significantly, as measured by the rigorous North Star Ambulatory Assessment. Beyond DMD, the company's clinical-stage pipeline is limited to a few antivirals in phase 1 development. If Exondys 51 fails its post-approval study, it would lead to devastating losses.